If you know me, or if you’re a regular visit to SkyLightRain.com, you’re probably aware that my obsession with art is growing increasingly consuming. I’ve even begun creating artworks of my own, attempting to capture my responses to the views around me. My trip to Iceland earlier this month was particularly rich in visual fuel – snow, skies, rocks and unfamiliar textures abounded. I came home with a headful of impressions, and rather than simply translate these into words, as I usually do, I have made efforts to churn some of it out in the form of art. After carrying out a few sketches, and watching a wonderful ‘wet-on-wet’ Windsor & Newton watercolour masterclass, this is what I came up with. It’s not quite what I see in my head, but it’s far closer than I expected to get, which makes me very happy. 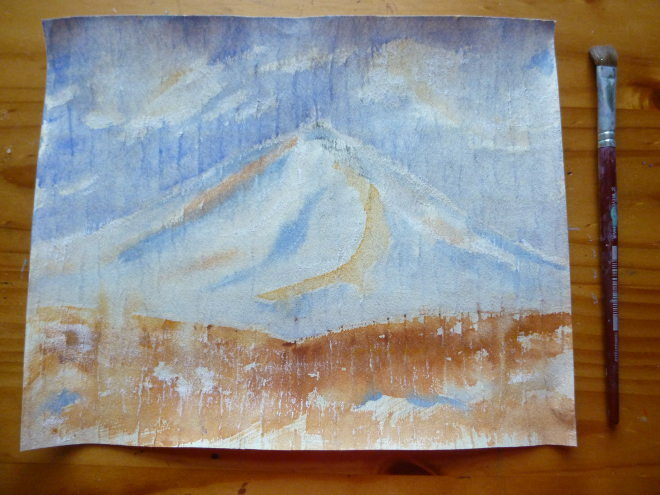 This entry was posted in Inspiration and tagged art, Iceland, watercolours by Judy. Bookmark the permalink.